The Kenyan attorney Fatuma Abdulkadir Adan works to bring together members of northern Kenya’s warring tribes. Her methods so far have included organising football tournaments and setting up a council of women to discuss men’s violence. The key ingredients in her recipe for success are stubbornness, creativity and unshakable optimism. After training as a lawyer, Fatuma Abdulkadir Adan returned from the capital, Nairobi, to her home town of Marsabit in northern Kenya to work for peace. Peace begins at home, as the poster of Eleanor Roosevelt in her office says. She first experienced tribal conflict in her childhood. Her mother used to hide her under the bed when shots were fired outside – as her own mother had done when she was a little girl. Fatuma wants to break the vicious circle of violence. She believes the game of football can help. The dust covers the field like a red veil. Today the boys are practicing in Marsabit’s town square. Shy young girls stand at the edge of the field. The football game shares the space with moped riders and a driving school, but the players move the ball forward skillfully despite the dust. 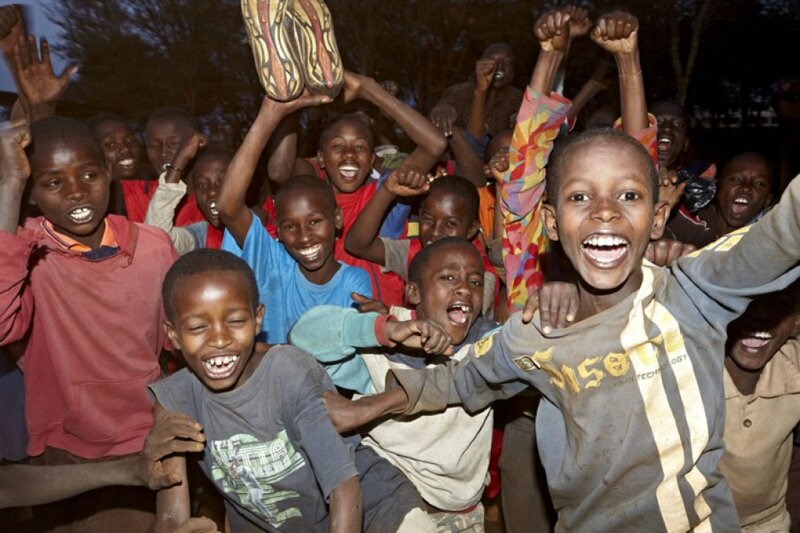 Football moves and motivates the children of Marsabit. It is autumn 2010, and they all know that Dortmund is leading the German Bundesliga. Of course they know the names Beckenbauer, Schweinsteiger and Thomas Müller. When a game is broadcast on television, they rush to a small iron hut where you can watch the English Premier League or the German Bundesliga for twenty cents. Players who work together toward a common goal are less likely to wish each other dead. That’s why Fatuma and her coaching team ensure that both tribes are represented on each team. Borana and Gabbra must play with, not against, each other. They practice together as well. “My hope is that they will play football together instead of slaughtering each other,” Fatuma explains. Here in the northernmost region of Kenya, the Borana and Gabbra tribal groups clash over water, pastureland, and cattle. Here the worth of a man is measured in the number of cattle he owns. Elsewhere in Kenya, no one talks about the conflict here. Hardly anyone knows it exists. People in Nairobi regard the region as wild and uncivilised. The tension between Borana and Gabbra claims human lives year after year. Sorrow and despair over the endless violence can be read in the faces of the region’s people. The 2005 massacre of Turbi, especially, left deep scars in the collective memory. Borana warriors slaughtered seventy Gabbra, most of them women and children. Many survivors still cannot talk about the experience. Fatuma wants to break the silence. “How shall I speak to you? As a Borana, as a Gabbra, or as a human being?” Fatuma asked women from both the hostile tribes. She had brought them all to a single place. The mother whose son was murdered by Borana sat next to the widow whose husband fell to Gabbra bullets. At first the mood was tense almost to the breaking point. But after the women took turns sharing their personal losses, there were tears of sympathy in everyone’s eyes. Sympathy with the victims. Fatuma frequently travels out into the countryside, to where it’s dangerous to be. To where she mediates directly between mutually hostile Borana and Gabbra. She doesn’t tell her parents the details. She doesn’t want them worrying. They would be overjoyed to see her safe and sound in a law practice in Nairobi. But others see the young woman as unusually well qualified for her work as a peace ambassador: Fatuma is half Gabbra, half Borana. Her parents are living proof that there can be peaceful coexistence between the two tribes. “My origins are both an opportunity and a burden,” Fatuma says. She chose to take advantage of the opportunity. Since she began her peace advocacy seven years ago, she has received many death threats on her mobile phone. “If you don’t stop, you’ll die”: She has read or heard those words in every possible variation. But she’s used to it. She shrugs her shoulders, refusing to be intimidated. Her commitment is to human rights. And the rights of women. She is sure she is doing the right thing. That helps her cope with the fear. Fatuma is the founder and director of an NGO called “Horn of Africa Development Initiative.” With her five-member team, she organises savings and loan associations for women, provides free legal advice, and organises football tournaments. “We have to help ourselves, because we know ourselves best,” she says with a smile that softens her direct way of expressing herself. During an excursion to the countryside around Marsabit, Fatuma recalls the day she almost gave up. It was April 10th, 2006. She had asked the region’s governing ministers and representatives to fly to Marsabit and lead peace talks. The plane carrying the peace delegation crashed on Mount Marsabit. Fourteen people died. Fatuma felt responsible, and she struggled with a sense of guilt. But she kept on. Since then there has always been a moment of silence in memory of the victims at the annual football tournament for peace. Fatuma’s hometown of Marsabit with its thirty thousand inhabitants is really only a small cluster of huts and houses. Every morning, she walks the hundred yards from the house where she grew up to her office. She knows everyone here. After all, she went to school here, just like her five brothers and sisters. She is a gifted networker who speaks just as casually with the American ambassador in Nairobi as with an old woman carrying firewood from the forest on her back. On her way to the office Fatuma greets an imam who has attended many of her soccer football tournaments. She chats with the carpenter who donated the wood for the goals. Laughs with the woman from the bookstore whose daughter plays left forward. Fatuma’s girls’ team is warming up on a field outside town. It looks unspectacular, but this was a minor revolution in mainly Muslim, conservative Marsabit. Once Fatuma was assaulted by an outraged mother. After listening to her imam, that mother did not want her daughter on the team. Young, radical preachers have cursed the girls in Friday prayers. One Muslim leader preached that soccer football players are no longer virgins. The open hostility strengthens the girls’ team spirit. But it is also a serious threat. 2008 was a painful year for Fatuma’s girls’ team. They were good that year, with a dedicated coach, in shape to win tournaments. But then the captain, the goalkeeper, the second-string goalkeeper, and a defender were abducted. It put a sudden end to the team’s girlish dreams of winning the championship – and to the victims’ hopes of happiness in life. Anna dribbles the ball skillfully despite her head scarf and long skirt. She was the captain of the promising 2008 team. An aggressive player, a solid tackler, with good ball control. Her enthusiasm is clear to see here on the field that glows green on the slopes of Mount Marsabit as if there were no drought. Anna was an enthusiastic football player before the day that changed her life forever. Hesitantly she tells Fatuma of the day she was abducted. Five strange men waited for her on her way home and dragged her into a car just outside her own front door. They held on to her for two days and two nights. She doesn’t know where. When it was over, she was pregnant. And soon after that, she was married to a man more than twice her age. Since then she wears a veil. School and football are now unthinkable. Why did Anna’s mother give her to this man? “I couldn’t feed another hungry mouth,” Anna’s mother says, looking down. Anna hopes she will be able to play football again some day. She places her confidence in Fatuma and her wealth of ideas. Fatuma walks with Anna and one of Anna’s friends across the piece of land she is trying to turn into a new football field. The girls should be allowed to practice, she says, without having to face insults in a public square. With her persistence, she is sure to succeed. Fatuma has big plans. Auma Obama, sister of the American president, is supposed to come from Nairobi for the dedication. She is responsible for sports activities at the aid organisation Care, and knows Fatuma, the restless peace-football-lawyer from Marsabit.